Cottontails Baby: Maileg rabbits make Elderflower Cordial! Maileg rabbits make Elderflower Cordial! I am so excited because I have just made a little film! It is called 'The Maileg Rabbits make Elderflower Cordial' and is the story of what happened when a few of our lovely cotton rabbits decided to try their hand (paws) at making Elderflower cordial. It all began when they found a simple little article in Country Living magazine. They did a spot of online research and came across this lovely blog by Ellie Tennant (the lady behind shopping ideas at Ideal Home). 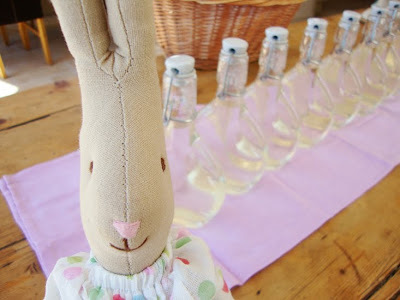 It's a really good place to start if you are a beginner at cordial making, like the bunnies. Now I'm off to have a glass of the yummy cordial! Oh, I saw the video on facebook and LOVED it. I took my mouse to the class I'm taking. I pulled the box out of my bag to show my table mates. They loved her. I'm thinking I might need a bunny now. I'm in love with Cottontails Baby. What a charming video - encapsulates all there is about a care free hot summer's day that's lost in childhood memories. 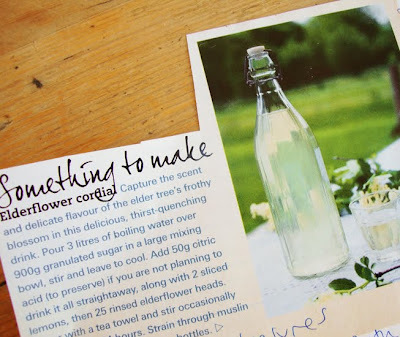 Have added you into our Elderflower page . . .